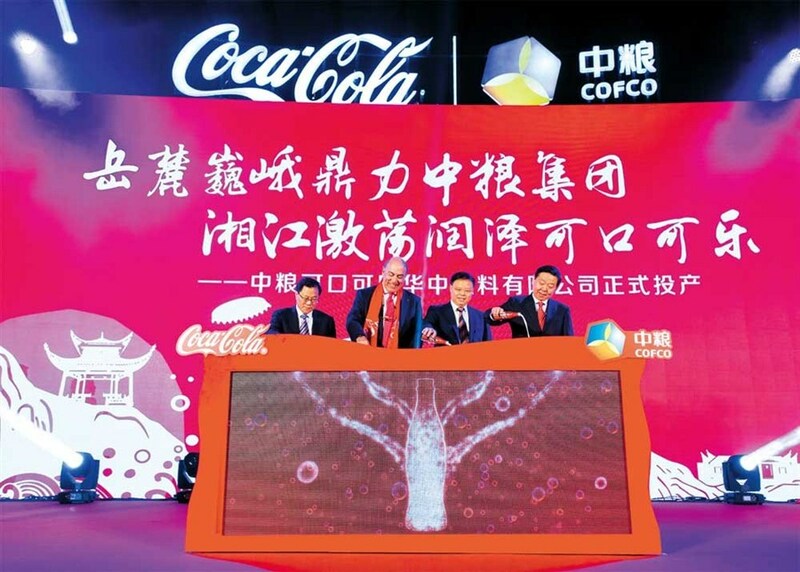 Muhtar Kent (2nd left), Zhao Shuanglian (right), chairman of COFCO Corp, and local government officials launch the operation of Coca-Cola’s new plant in Changsha. MUHTAR Kent, chairman and chief executive officer of The Coca-Cola Co, and Zhao Shuanglian, chairman of COFCO Corp, officially kicked off operations at Coca-Cola’s 44th local production facility in China on Tuesday. Located in Changsha, capital of Hunan Province, the new plant is operated by COFCO Coca-Cola Huazhong Beverages Co and is the biggest Coca-Cola bottling plant in central China. The completion of the new plant marks an optimized business layout by Coca-Cola in China’s central and western markets. The new plant is designed to accommodate nine production lines — four for water products, four for sparkling beverages and one for juice and juice drinks. Four lines are operating today and all nine lines are expected to be put into operation by 2020. As the first Coca-Cola plant in Hunan that has non-sparkling beverage production lines, COFCO Coca-Cola Huazhong Beverages will play a key role in expanding production of an array of non-carbonated beverages for consumers in this growing region with expected annual production capacity of 1 billion liters of beverages. “China is our third largest market by volume and we remain upbeat about the potential for growth throughout the market. Over the past few years, China’s consumer market has undergone significant structural change and we have continued to invest and adapt to ensure we are best serving our consumers and customers in a fast-changing market,” said Kent. “Earlier this month, we completed the majority of refranchising of company-owned bottling operations in China to strong local partners, including COFCO, which will leverage this new plant to further expand the reach of our growing beverage portfolio in central China,” he said. Zhao said: “The completion of COFCO Coca-Cola Huazhong Beverages Co is a new milestone in the history of COFCO and Coca-Cola cooperation, and also our strategic move to explore the central China market. China’s long and stable economic growth provides great opportunity for sustainable development of the beverage industry. Representing a total investment of 320 million yuan, the new 150,787 square meter plant is located in the state-level Wangcheng Economic and Technological Development Zone. It adopts strict control procedures to ensure the consistent quality of Coca-Cola products. While providing high-quality and diverse products, the plant also abides by green standards with a focus on the use of clean energy and recycling of resources. Its rainwater recycling system and other resources reuse systems all receive the Gold Certification of Leadership in Energy and Environmental Design. The environmentally friendly plant follows the top-level national safety standards during the construction process and gives priority to production safety. In the future, it is expected to become the first food and beverage company in Hunan Province that is certified to adopt the top-level safety standards. It is also set to further enhance the overall competitiveness of the food and beverage industry in Changsha or even in Hunan, and is of great significance to effectively foster new industrialization process in the province. It is a key part of Coca-Cola’s three-year, US$4 billion investment plan in China between 2015 and 2017.